A scene from a previous Rising Stars Miniature Golf Tournament. The group works to help high school students develop leadership skills. The time is now! 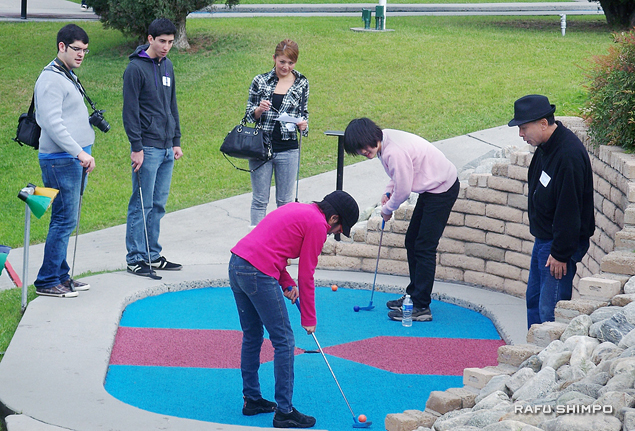 On Saturday, March 3, from 9 a.m. to 2 p.m., the Rising Stars Youth Leadership Program will be hosting its ninth annual Miniature Golf Tournament at Camelot Golfland, 3200 Carpenter Ave., Anaheim. It will be a day of family fun, food, and friendly competition. Part of the fun will be a raffle with the top prizes being an iPad 2, an iPod Touch, and two tickets to Disneyland. Any and all support would be appreciated, including participating as a golfer in the tournament, buying raffle tickets, or making a financial contribution as a sponsor. Pre-sale tickets are $10 and include golf and lunch. Tickets at the door will be $15. And to simply come and have a nice pizza and salad lunch, the cost will be $7. So please come support tomorrow’s leaders of the Japanese American community. All proceeds will go to helping a new class of Rising Stars youth acquire the leadership skills they will need for their futures. The Rising Stars Youth Leadership Program is a five-month program of the Nikkei Federation for high school students that enables them to learn leadership skills and inspires them to be more active in the Japanese American community through interactive workshops and cultural education. The program helps young students achieve their full potential as leaders. Once or twice a month, the teens meet together for leadership training sessions and for cultural activities and lectures that will help them to not only understand their history, but also to make history with the skills they learn. With expert training by highly experienced professionals, the teens learn such skills as team building, financial fitness, and public speaking. For nine years the Rising Stars Program has been helping high school students develop their leadership skills. So to keep the program going, enough funds need to be raised through the tournament so that a new class next year can be sponsored. Help build tomorrow’s leaders today, and come support the Rising Stars at the Miniature Golf Tournament. The Rising Stars Youth Leadership program is sponsored in part by the Japanese American Cultural and Community Center as the venue sponsor and by The Rafu Shimpo as the media sponsor. Mari McCarthy is a participant in the Nikkei Federation Rising Stars Youth Leadership Program.